what's the "fuss" all about? conceived by the bay and born out of love, fuss is a collection of hand illustrated, hand silk-screened, and hand packaged apparel for babies (and grown ups too!). as the hobbyist endeavor of founder + designer lissa lowe, fuss arrived on the san francisco scene as people began to crave meaningful, hand crafted items of yesteryear. having garnered national press for its simple, playful designs, lissa's "passion with purpose" instantly struck a chord with parents and gift-givers alike. not only are fuss designs cleverly cute, but also charitable. by donating a percentage of its proceeds to the ovarian cancer research fund, fuss is able to celebrate a global community of women who find daily joy in their hearts and sparkle in their eyes despite the challenges of illness. fuss is also full of heart — dedicated in loving memory of lissa's mom, mary, who left a trail of glitter in this world that lissa continues to follow today. thank you for stopping by and supporting this wee bit of goodness. all marketing copy, artwork & other materials copyright © 2009 fuss frocks, llc. 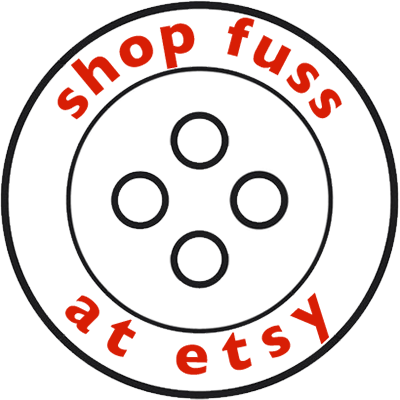 "fuss" & the fuss logo are trademarks of fuss frocks, llc. all rights reserved.